A SpaceX Falcon 9 rocket topped with 10 Iridium-NEXT communications satellites on the pad ahead of a planned Jan. 14, 2017 liftoff. A SpaceX rocket will take to the skies today (Jan. 14) for the first time since a Sept. 1 launchpad explosion, and you can watch the highly anticipated liftoff live. SpaceX's two-stage Falcon 9 rocket is scheduled to launch 10 communications satellites for the company Iridium into low-Earth orbit today, with liftoff from California's Vandenberg Air Force Base targeted for 12:54 p.m. EST (1754 GMT; 9:54 a.m. local California time). You can watch it live here at Space.com, courtesy of SpaceX. 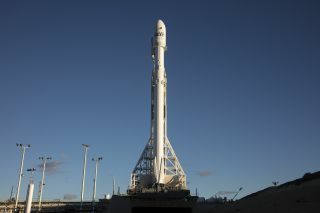 You can also follow the launch directly via SpaceX at http://www.spacex.com/webcast or https://www.youtube.com/user/spacexchannel. The 10 satellites are the first of a planned 70 that SpaceX plans to loft for Iridium's new NEXT constellation over a series of seven launches. This network will replace the constellation of 66 spacecraft that Iridium currently operates in low-Earth orbit, company representatives have said. An artist's illustration of an Iridium NEXT satellite in orbit. An engineer works on one of 10 Iridium NEXT satellites prior to its launch into orbit on a SpaceX Falcon 9 rocket. Today's liftoff — which was pushed back from Jan. 9 because of bad weather and issues with launch-site availability — will also include some action in the downward direction. SpaceX plans to try to land the Falcon 9's first stage on a robotic "drone ship" stationed in the Pacific Ocean, as part of the company's effort to develop fully and rapidly reusable rockets. This is a priority for SpaceX founder and CEO Elon Musk, who has said that such technology will slash the cost of spaceflight and help open the heavens to exploration. The Sept. 1 explosion, which occurred during a routine prelaunch test of a Falcon 9, destroyed the rocket and the $200 million Amos-6 communications satellite. SpaceX investigators traced the cause of the accident to the failure of a high-pressure helium tank inside the Falcon 9's upper stage. SpaceX announced earlier this month that it had wrapped up its mishap investigation. The Federal Aviation Administration has accepted the results of the inquiry and has granted SpaceX a launch license that covers the seven liftoffs required to loft the 70 Iridium-NEXT satellites from Vandenberg.